The Gourmia GFD 1650 premium countertop food dehydrator comes equipped with six adjustable shelves and a total of eight preset temperature settings. It features noiseless airflow circulation that works to improve even temperatures throughout the dehydrator so that every tray will dry evenly. This model features six and a half square feet of drying space across each of the trays, while each of the trays can handle up to one pound of food. This model is perfect for fruits, veggies, poultry, meat, and fish. You can also prepare trail mix and other types of snacks. This model is powered by four hundred watts of power. This unit is able to harness temperatures between 95F and 158F. It also dries in thirty-minute increments. The dehydrator is made up of mostly plastic, however, it has a sturdy feel. This dehydrator actually has a reputation for working faster than competing models, thanks to the included temperature presets that provide the user with the ability to change the setting based on the type of food that they’re processing. Delicate items such as veggies and fruits can easily dry out, or the nutrient content can become damaged if they’re cooked on a higher setting. With beef, poultry, and fish, you’ll need to use a higher temperature to prevent bacteria growth during the longer process time. The controls are simple to use, making this model perfect for the novice. With this package, you’ll get the dehydrator, user’s manual, and cookbook. While this machine only has one function- to dehydrate food, the manufacturer recommends a number of dishes and snacks that you can create using this model, such as fermented foods and yogurt. Using the Gourmia allows your veggies and fruit to retain their original minerals, vitamins, and enzymes more efficiently compared to other methods of food preservation. In fact, recent studies have shown that dried fruits such as plums, grapes, and cranberries actually contain twice the amount of antioxidants compared to their fresh counterparts. This is huge in a world that’s flooded with chemically altered food that has very little nutritional value. Plus the easy dehydration process will allow you to enjoy some of your favorite foods year-round. You can dehydrate yellow cherries and enjoy them anytime, which is a great way to maintain more variety in your diet throughout the year. As we mentioned, the manufacturer points out a ton of food options for this model including dried fruit snacks, oranges, strawberries, apples, prunes, and banana chips. You can also enjoy dried kale, sweet potato chips, zucchini, and green beans. Fruit leathers are another popular option and they’re made from pureed fruit. Love granola? Have you ever tried to make your own? With this model, you can. You can also use it for seeds, nuts, bread, dried flowers, dried herbs, dog treats, fire starters, potpourri, and herbal teas. Because most dried foods have a shelf life of one year, you’ll end up saving a ton of money otherwise spent on expensive dried fruit, granola, fruit snacks, and jerky. Now, let’s talk about storage. During strawberry season, if you want to enjoy strawberries year-round, you can purchase several flats of strawberries during the summer, dehydrate them and enjoy them anytime you want. In fact, rehydrating them for certain recipes such as jams or smoothies is a great option. During the offseason, a pint of strawberries will often go for three times what it’s priced at during the strawberry season. Not only that, but when you dehydrate food, it shrinks, so you can purchase as much fruits and veggies as you want and easily store them away in vacuum-packed storage bags or mason jars, which is the best solution if you’re tight on space but you want to stock up on your favorite foods. Most people who travel during the summer complain that they don’t have access to healthy food options. This is yet another time when your food dehydrator will come in handy and prevent you from breaking your diet. This dehydrator will give you a healthy snack that’s easy to eat when you’re on the road, on a plane, or camping. Who needs fast food when you can snack on a nutritious diet of homemade beef jerky, your own fresh granola, and a handful of mixed berries? This countertop model is pretty compact, which means you can also take it with you on longer trips. The benefits that come with purchasing this machine for food preservation are almost endless. Pros: The airflow circulation feature works incredibly well, producing no noise whatsoever. This machine is so quiet you can use it on the ten-hour cycle during the night and allow your food to process while you sleep. Because there are only a couple of variables: temperature and time, this device is very user-friendly. 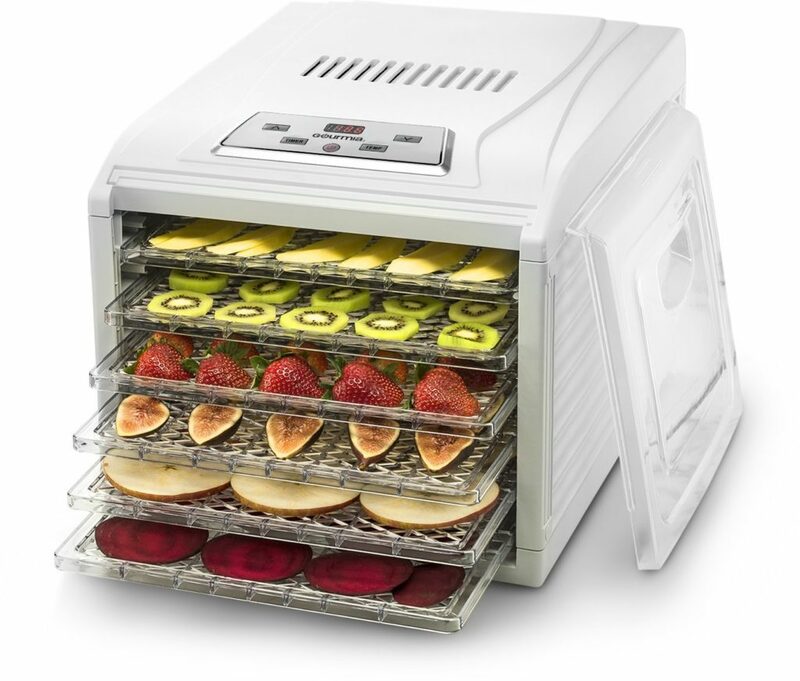 This dehydrator offers an economical way to make delicious dried fruits and veggies, beef jerky, fruit leather, and dried herbs. It also offers the perfect way to preserve foods with no preservatives or additives required. The built-in timer is a huge selling point, allowing users to set it and forget, as they go about their day while their food goes through the extensive drying process. Cons: Unlike other brands, the maximum temperature of just 158F is a downside for some because it can take much longer to cook jerky. Because there aren’t many temperature controls, some consumers found this feature limiting. Gourmia has outdone themselves again by producing this user-friendly, affordable food dehydrator that will make your life just a little easier. You can have fun creating your own snacks, packaging and storing your favorite fruits and veggies for the winter months, and you can even get creative and make your own trail mix, for a snack that’s tailored to your energy needs and diet goals. Consumers who purchased this model gave it a rating of four out of five stars.